INTRODUCTION: Controversy exists over the importance of operative time on patient outcomes. It is unclear whether faster is better or haste makes waste or similarly whether slower procedures represent a safe meticulous approach or inexperienced dawdling. The objective of the present study was to determine the effect of operative time on 30-day outcomes in laparoscopic surgery. METHODS: Patients undergoing elective general surgery procedures (colectomy, cholecystectomy, Nissen fundoplication, inguinal hernia and gastric bypass) from the ACS-NSQIP 2005-2008 participant use file were identified. Exclusion criteria were defined a priori. 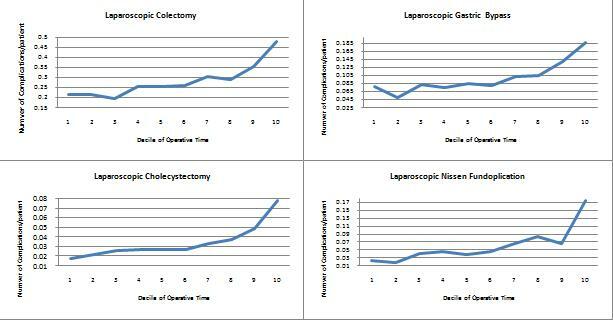 Operative time was divided into deciles and summary statistics were analysed. Univariate analyses using a Cochran-Armitage test for trend were completed. The effect of operative time on 30-day morbidity was further analyzed for each procedure type using multivariate regression controlling for case complexity and additional patient factors. Patients within the tenth deciles were excluded to reduce outliers. RESULTS: 76,748 elective general surgical patients were analyzed. Univariate analyses of deciles of operative time demonstrated a statistically significant trend (p<0.000) toward increasing odds of complications with increasing operative time for laparoscopic colectomy (n=10,135), cholecystectomy (n=37,407), Nissen fundoplication (n=4,934) and gastric bypass (n=17,842) as demonstrated in the figures below. The trend was not found to be significant for laparoscopic inguinal hernia repair (n= 6,430, p=0.14). Multivariate modelling revealed the effect of operative time to remain significant when additional patient factors were controlled for. Similar trends were noted in comparable open cases. CONCLUSION: Increasing operative time was associated with increased odds of complications and so it appears that speed may matter in laparoscopic surgery. These analyses are limited in their inability to adjust completely for all patient factors, potential confounders and case complexity. Additional multivariate and hierarchical surgeon level analyses are required to examine this relationship further.